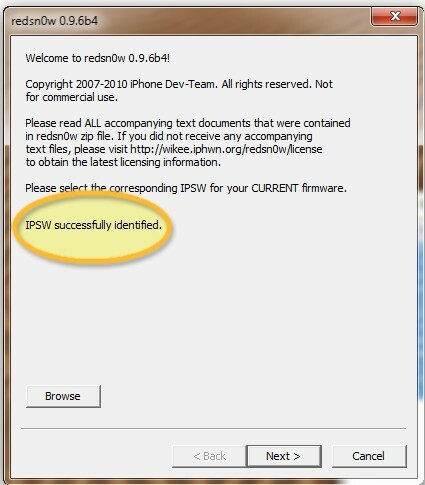 The iPhone-Dev team today released an updated version of Redsn0w that can be used to jailbreak iOS 4.2.1. The new Redsn0w 0.9.6 b4 enables iOS 4.2.1 jailbreak on iPhone, iPod Touch and iPad. It is based on Geohot’s iboot exploit in Limera1n, and is a tethered jailbreak. So if you are rebooting your jailbroken idevice, you should be near a PC or Mac to take it to the jailbreak mode. However, Redsn0w 0.9.6 b4 support un-tethered jailbreak on iPhone models with old iBoot ROM and in iPod Touch 2G models. So until someone releases a complete working untethered jailbreak for iOS 4.2, Redsn0w 0.9.6 b4 is the only option to get Cydia working in your device. Follow our step by step guide to jailbreak iOS 4.2.1 using Redsn0w. 1. Download iOS 4.2 ipsw corresponding to your iPhone, iPod Touch or iPad here. 2. Download Redsn0w 0.9.6 b4 for Windows or Mac from Hotfile here. 3. Open Redsn0w and point it to the downloaded iOS 4.2.1 ipsw file. 4. If you have pointed it to the correct file, it will show something as given above. Click next. 5. At this point you need to check Install Cydia option and proceed. 6. Press Power OFF button and enter into the DFU mode. Just follow the steps given in the Redsn0w 0.9.6 b4 UI, if you are not sure about this. 7. Redsn0w 0.9.6 b4 will now install iOS 4.2.1 jailbreak files in your iPhone, iPod Touch or iPad using the Limera1n exploit. 8. If your are on an iPhone 3G, iPhone 3G S ( old iBoot ROM) or iPod Touch 2G ( model not starting with MC), steps to your untethered iOS 4.2.1 jailbreak completes here. Cydia should be there in your Springboard. 9. As said earlier, Redsn0w 0.9.6 b4 is a tethered jailbreak for iPhone 4, iPhone 3G S ( new model), iPad, iPod Touch 4G, 3G, 2G (MC) and iPad. So even a jailbroken device in this category should use Redsn0w again and boot it to the tethered jailbreak mode as shown below. After that you can access Cydia, or SSH into the device. A non boot-tethered device will show a Grey or White Cydia icon instead of the bright one. We can expect a full, un-tethered iOS 4.2.1 jailbreak, and an Ultrasn0w unlock very soon. 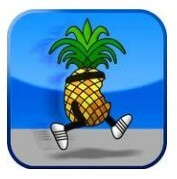 Update: Now you can jailbreak iOS 4.2.1 untethered with Pwnagetool 4.2 (Mac) and Sn0wbreeze 2.2 (Windows). Works good! Should post more details about all options like “Enable Multitasking” and “Enable Verbose” to the instructions. i just tried upgrading and then jailbreaking. cydia doesnt work. the icon is white. it crashes after i press the icon. You have to use Redsn0w again and boot it to the tethered jailbreak mode. Hey, I’m kind of new to this jailbreak stuff and wondered if someone could help me? If I was to follow this guide, would I upgrade and install iOS 4.2.1 through iTunes first and then follow the steps above? Or steer clear of the iTunes update all together? Will I lose all the information of my device? Also, I jailbroke my iPod Touch 2nd Gen on 4.1. To upgrade to 4.2.1 jailbroken, do I follow these steps, or basically, how can I upgrade to 4.2.1, whilst staying jailbroken and not losing any of my Cydia apps? Any help you can offer me would be great. Do not use iTunes. You need an offline OS 4.2.1 ipsw file of your iPod Touch 2nd Gen. This is because Redsn0w 0.9.6 b4 needs the corresponding iOS version to process jailbreak. First check if your iPod is an MC model or not. You can check that from settings>General>About> Model. If it is, then you can proceed to an untethered jailbreak as shown in the guide. 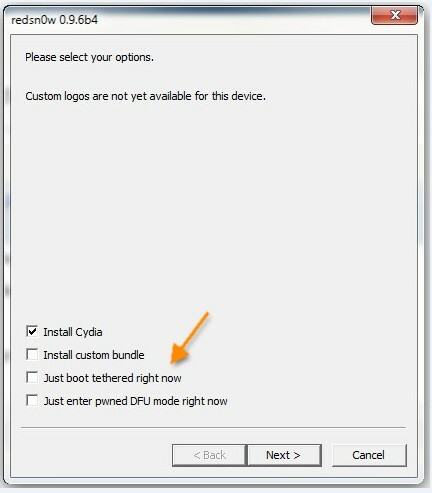 Else you need to opt for the tethered jailbreak shown in step 9. Now regarding Cydia and apps in iOS 4.2.1 jailbreak. You can use Cydia apps PkgBackup or AptBackup for restore, or there is a manual method using OpenSSH, MobileTerminal and Gawk. says it doesnt work with with mc models yet did i do something wrong? What should i do to quit DFU mode? mine stucked on the wainting for reboot? mine stucked on the wainting for reboot! Jhon, not sure what you are talking about. But if you got your device stuck at during a jailbreak, you may restart it by pressing the power button firmly. Again enter into DFU mode, open iTunes and restore your firmware to iOS 4.2.1. Restart the jailbreak process again. It got stuck on “Waiting for reboot” in redsn0w and now it won’t turn on lol lame. I’ve held down the power button for 10 minutes and still nothin’. I have a non MC version iPod touch 2g. Firstly, I think this guide has been very helpful. All the steps were clear and easy enough to follow. The only problem I face is after installing Installous and trying to download my apps, I receive this error – ‘API error permission denied’. I do not know how to go about this, so some assistance would be great. I will be following this thread closely. If you are getting API error permission denied message, go to the settings, and then clear the cache data for icons and category. Then load Installous again. im stuck during the part were it says exploiting in limera1n its half way done then it just stops. Any help!!!?? im stuck during the part were it says exploiting in limera1n its half way done then it just stops. Any help!!!??? If i were jailbreak with redsnow,can my iphone4 power off?? You guys mentioned that if I wanted to remove the API error, I’d have to go to settings and clear cache for icons and category. But under the settings in Installous, I am unable to find anything that I can clear. I’m using Installous 3.6. I also thought you may be referring to the iPhone settings, but the only cache I could clear there was Safari’s. Will anything on my iPod get deleted or anything bad happen if I choose to jailbreak? How long has it to take for finishing with this “exploiting with limera1n” process? Seems it has stuck, any idea? How long???!!! How long should it take for this “Exploiting with limera1n” process to finish??? Does this means i jailbreak it once again? Hi, i managed to use Redsn0w again boot in tethered jailbreak mode and temporary fixed the white icon issue. I was able to launch Cydia and i saw there 4 updates in the Changes. Once i updated, I’m not able to launch Cydia again. I tried using redsn0w to jailbreak my 3gs with 4.2.1 but it keeps freezing up at the “waiting for reboot” screen. I tried various versions of redsn0w, and 2 different pcs with differing versions of windows but still no luck. I then tried to downgrade my ios using sn0wbreeze, but kept getting a pop-up saying “firmware mismatch”. Hi. I have an iPhone 3GS with 4.2.1 and the new bootrom thing. With a custom IPSW for 4.1 and Redsn0w IPSW file 4.2.1, will i be able to untether JB? I tried the option “Pwnd DFU mode” then i went to Itunes to restore it to ios 4.1 but it says something like this iphone could not be restored. I wanna downgrade to 4.1. Plkease help. After it says “Extracting Software/Firmware” it says i think “Approving restore with Apple” then it gives me an error message. how long would it take for “waiting for reboot” after the phone has gone through DFU mode? I decided to cancel but could not power the phone back on anymore….any help would appreciated. You Just push sleep and home bottons intil you see apple logo. You are getting the freeze at the “waiting to reboot” screen because there is a firmware mismatch = iphone ios mismatch. I had the same thing but I found a way around it (will explain). First, to reboot your phone you have to press down the power button and the menu button together for about 10 seconds. Your phone should reboot without any problems. Do i have to download the iOS 4.2.1 file because my ipod touch version is already 4.2.1? Hi, Sorry to bother you guys, I just got my iPhone 4 from the US, i put my Sim Card and its not opening, what do I need to do exactly to unlock it? Does RedSnow guide do it all? stuck on waitning to reboot, starts to jailbreak but stops(white screen)when it gets to “waiting to reboot”! can someone please help? It your getting stuck in the reboot make sure your running this is compatibiliy mode of windows xp service pack 2, also make sure you run as admin. I JB my new iPhone 4 and got the white Cydia icon like the guy above, I went and ran Redsn0w again and boot it to the tethered jailbreak mode. Now all I get is a Yellow pineapple with a white circle in the center going around and then it froze. I forced a restart and the Cydia icon is still white and does not launch. What am I doing wrong? I followed every step mentioned on 3GS iOS 4.2.1 with new bootROM, I had used Redsn0w 0.9.6 b4 & Redsn0w 0.9.6 b6 too to jail break, but it is getting stuck on Ramdisk after first reboot and on iphone it is still showing “downloading Jailbreak Data….”. I had tried Redsn0w on Windows Vista as admin, but no luck. Rebooted in tethered mode too, but no luck. Either tell me someone so that I could downgrade it without SHSH image or backup or I could jailbreak it smoothly. its works on my ipod touch running 4.2.1. My computer is running on windows vista. I downloaded redsn0w 0.9.6 and jailbroke it without any problems whatsoever. By the Way, i am a tester so please comment asking me questions. I will be glad to answer! I have an Ipod Touch 2g MC model. Every time i use redsn0w it says my model is not supported yet. does anyone know what i can do so it will work, or a link to a redsn0w thats compatible? thanks. Why is that whenever I get to step 3 where I select the iOS 4.2.1 ipsw file, I can never find it? how do i find the 4.2.1 file? i have an iphone brought from usa working with iso 4.0.2. its working fine till now except for internet ..
i would like to know how do i install iso 4.2 safely in my phone ? Check out Mac Owners Support Group for help with Mac products. Post any questions in our forums. It seems like im not the only one having this problem and we haven’t gotten a direct answer, so only answer me if you have experience and you know it works. I am trying to jailbreak my friends itouch 3gen iOS 4.2.1 which he upgraded accidentally. I have already gone through the pains of jailbreaking so I understand what to do. I got the correct firmware downloaded and it reads it just fine. I check off battery percentage and install cydia. I changed the affinity setting correctly and run as administrator. None of these work, so don’t tell me to do any of those. Give me what works, there seems to be no solution. I know i put it into DFU mode correctly as I have done it before. The problem always occurs with exploiting limera1n. I was told in one tutorial to run firmware 4.1 instead for the same device, but that got stuck at waiting for reboot. Please help! Hi! I thought I successfully jailbreaked my iphone 3G (that was previously updated to version OS 4.2.1. ), but every time I insert my SIM card it shows as there is no network connection (carrier) at all. Furthermore, in settngs, on the main screen there is no option “carrier”. Can someone help? Thnx! i don’t have no signal.why? I’m not sure if I’m getting stuck on the “uploading ramdisk” section or how long does it take in that section? Will my data be erased when I jailbreak it?